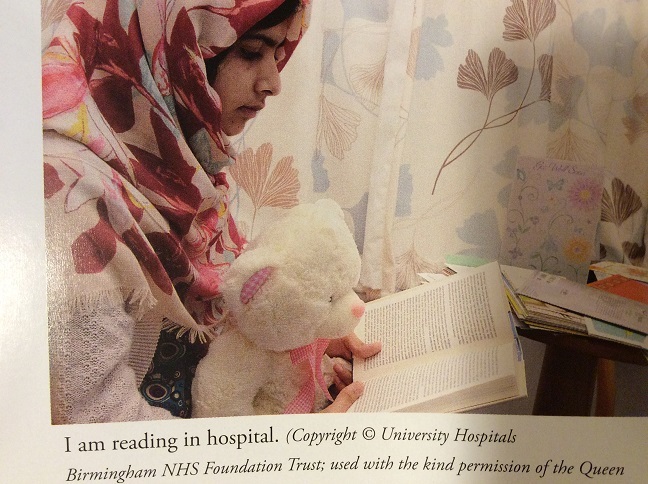 Hi, I am reading "I am Malala" by Malala and Malala has a bear who helped her heal in the hospital. Here is a photo I found and it seems like the bear enjoys reading too like me and I think we would be good friends. The bear is named Lily. Then a kind lady called Dr. Fiona came and gave me a white teddy bear. She said I should call it Junaid and she would explain why later. [Colonel Junaid Kahn was an army surgeon who had performed emergency brain surgery on me in the military hospital in Peshawar, where I was first brought after being shot in the head.] I didn’t know who Junaid was, so I named it Lily.